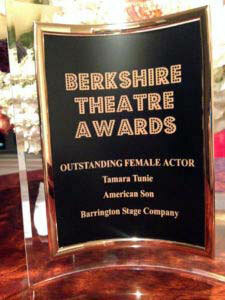 The First Annual Berkshire Theatre Awards were presented on November 13, 2016, at Mister Finn’s Cabaret in Pittsfield. Seventeen arts journalists voted on 120 nominees in 25 categories chosen from artists in the 75 live theatre productions mounted in Berkshire County and adjacent areas between October 1, 2015 and September 30, 2016. The Larry Murray Award, given to a person or theatre project that advances social, political or community issues. The Producing Directors of the Dorset Theatre Festival, Weston Playhouse Theatre Company, and Northern Stage for co-producing The Norman Conquests, three plays over a four-month period employing three designers, three directors, and a company of players to bring this trilogy to the widest community possible. Kristen van Ginhoven, Co-founder and Artistic Director of WAM Theatre, for the company’s innovative double philanthropic mission supporting non-profits that benefit women and girls locally, nationally, and internationally. Julianne Boyd, Artistic Director of Barrington Stage, for total commitment to the community through her programming and outreach. The 2016 Berkshire Theatre Awards voters included Mark G. Auerbach of the Westfield News Group, Peter Bergman of Berkshire Bright Focus and the Berkshire Edge, Jeffrey Borak of the Berkshire Eagle, theatre historian Bob Bruyr, Dan Dwyer of Off Script, Helen Epstein of Arts Fuse, Bob Goepfert of the Troy Record and WAMC, Charles Giuliano of Berkshire Fine Arts, Rex Hearn of the Berkshire Record, Macey Levin of Berkshire on Stage, Gloria Miller of Curtain Up, Larry Murray of Berkshire on Stage, Chris Rohmann of the Valley Advocate, Fred Sokol of Talkin’ Broadway, Stephen Sorokoff of Broadway World, Bob Sugarman of Theatre Talk, and Sally Sugarman of WBTN and More Theatre Talk. Also participating in the program but not voting were Gail M. Burns and Ed Sedarbaum.